Over the last year, I have grown to love IPAs. I seek them out whenever we’re trying new beers, some may say (ahem, Dylan might say) that I’m obsessed with them. Don’t get me wrong, I still love stouts and porters, but IPAs have me smitten. They are perfectly refreshing, and the ones I love have a great hoppy bitterness that makes them perfect for me. I know IPA day is in August, but I don’t need a special day to enjoy the beer I love. 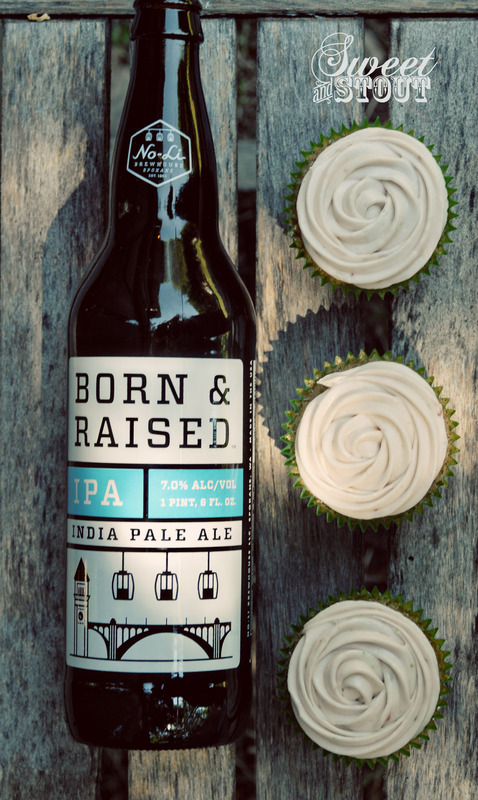 We picked up a bottle of No-Li Brewhouse’s Born & Raised IPA this weekend and I wanted to give it a try in a new cupcake flavor. IPAs are notoriously not favorable to bake with because they can be bitter, but I embrace the bitter! This week I matched it with a strawberry lime cake, the perfect contrast to the floral, hoppy, and bitter Born & Raised IPA. I used a buttercream frosting and used strawberry preserves and a little bit of lime zest and juice to flavor it. The frosting turned out sweet enough to be able to eat it (by the spoonful), but the lime gave it a bit of tartness that was really pleasant. After frosting these I had to set them in the refrigerator for a little bit so they wouldn’t melt. It’s a bit of a hot one here today (My computer tells me it’s 96 degrees out right now!). After we are all done with cupcakes we’re planning on having a couple frozen strawberry lime margaritas to beat the heat. The perks of left over ingredients! Last week I posted a question on our facebook page about what flavors you guys think we should add to our commercial set up. Have you had a chance to weigh in on that? After our wedding (less than 2 weeks now! woohoo!) I’m planning on adding 1 or 2 flavors commerically and I’d love it to be a flavor that you’re interested in trying! Your feedback is greatly appreciated. 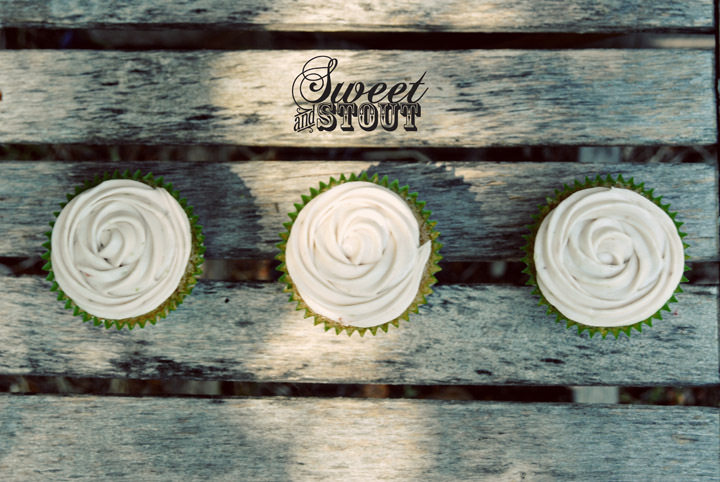 Oh, and if you’re in Spokane, you should head over to No-Li Brewhouse and have a Salted Chocolate Caramel cupcake made with their Imperial Stout! 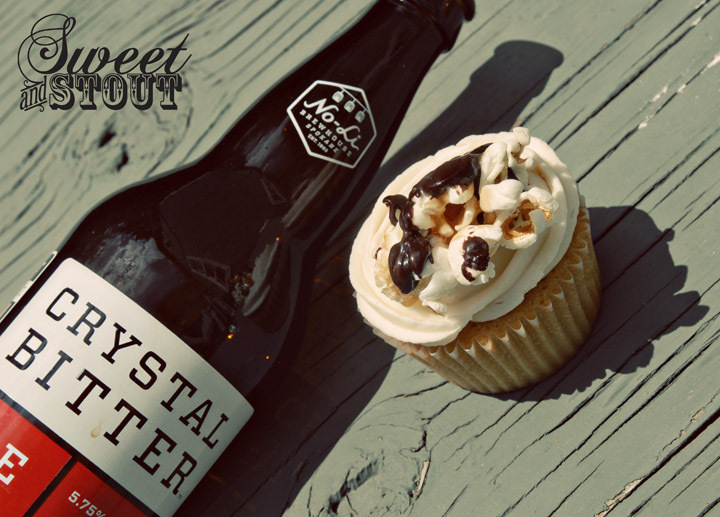 This week the Manito Tap House has our Red Velvet, Salted Chocolate Caramel, and Chocolate Peanut Butter cupcakes. I hope your extended weekend was filled with fun, good food & great beer! Dylan and I laid low all weekend, then on Monday we decided we had better make some cupcakes. The idea for this week’s cupcake came from a couple different places. Last Thursday, Dylan happened to meet John Bryant of the newly re-invented No-Li Brewhouse, here in Spokane. He ended up buying a couple of each of their new bottles: Crystal Bitter Ale, Born & Raised IPA (my favorite), and Silent Treatment Pale Ale. 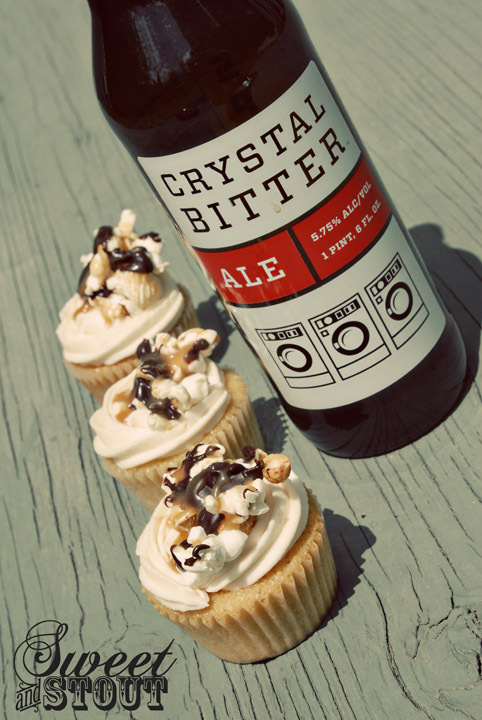 There were talks about how we should do a No-Li Cupcake, so after we tried each of the beers, we decided to use the Crystal Bitter Ale in this week’s cupcake, Caramel Popcorn. The cake flavor came about as I was discussing ones we haven’t done yet, with my coworker, JoNelle. 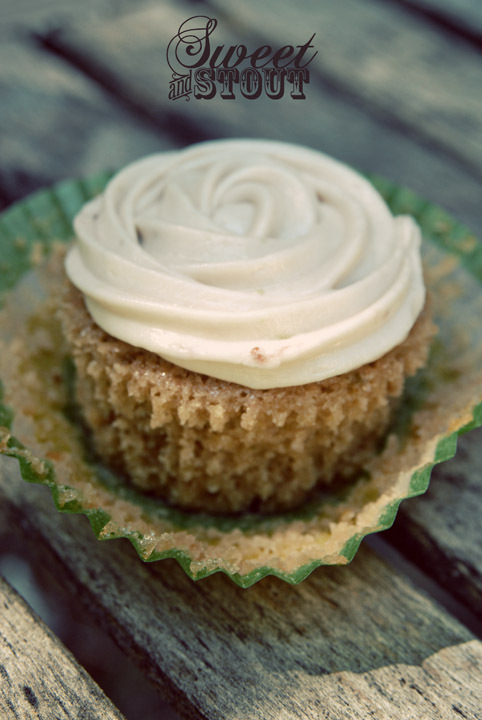 She’s always thinking of new cupcake ideas, and when she started to talk about caramel, I knew we were on to something. We both agreed that the Crystal Bitter would be a great match for caramel. 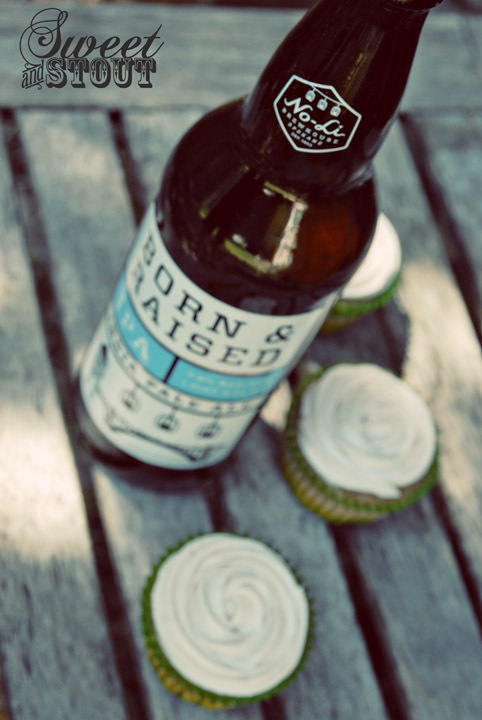 The malty smoothness of this ale compliments the rich caramel flavor these cupcakes exude. I made caramel from scratch, and while it’s kind of messy, you can really taste the difference between it, and store bought caramel. The ingredients are really simple: just sugar, water, butter, and cream. I wanted to add the popcorn in to give the cupcakes the salty contrast that goes really well with caramel. Before we made the cupcakes, we had to make the popcorn. Using the air popper, we made a ton of it, and spread it out on a cookie sheet (with wax paper lining it – I did not want to clean that mess up). After melting chocolate chips in a double boiler, I drizzled it over the popcorn along with some caramel, tossed in peanuts, sprinkled with a little bit of sea salt and put it in the fridge to cool off. The cake turned out really soft and delicious. Basically it’s a yellow cake with added caramel and the Crystal Bitter, of course. The frosting was made using browned butter and powdered sugar, and I’m surprised how much it tastes like caramel despite having none added to it. We garnished each cupcake with a good chunk of the chocolate caramel peanut popcorn we made earlier, and voila! 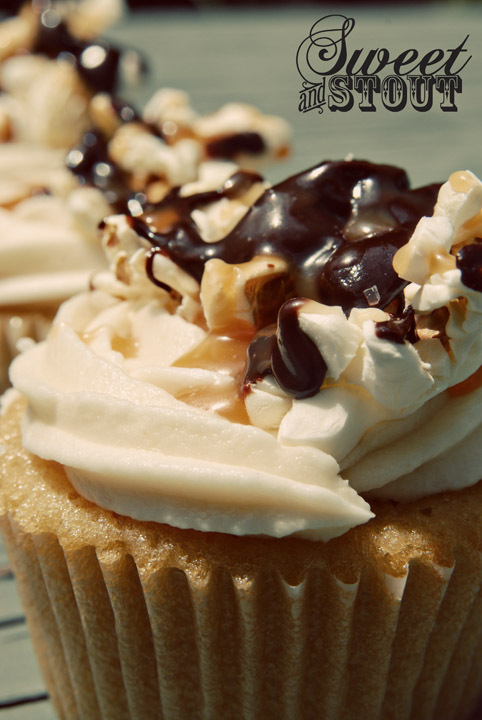 Caramel Popcorn Cupcakes were born. After one bite, I knew that people were going to love these, they are SO good!